So, what are microorganisms exactly? Microorganisms are actually a diverse group of organisms. The fact that they’re micro isn’t even true of all microorganisms — some of them form multicellular structures that are easily seen with the naked eye. Bacteria are a large group of unicellular organisms that scientists loosely group as Gram-negative and Gram-positive, but in reality there are many different kinds. Archaea are another group of unicellular organisms that evolved along with bacteria several billion years ago. Many are extremophiles, meaning that they thrive in very hot or very acidic conditions. Archaea are more closely related to eukaryotes than to bacteria. 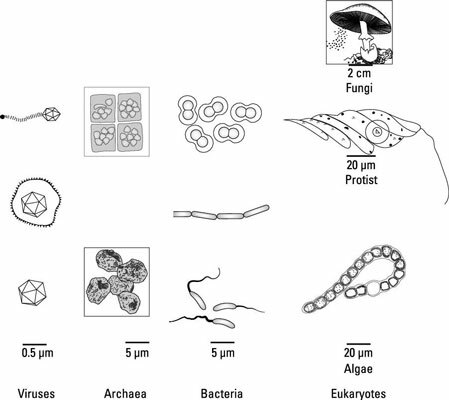 Eukaryotic microorganisms are a structurally diverse group that includes protists, algae, and fungi. They all have a nucleus and membrane-bound organelles, as well as other key differences from bacteria and archaea. All the rest of the multicellular organisms on earth, including humans, have eukaryotic cells as well. Along with the many eukaryotic microorganisms, the Eukaryotes include all multicellular life on earth, like plants, animals, and humans. Viruses are smaller than bacteria and are not technically alive on their own — they must infect a host cell to survive. Viruses are made up of some genetic material surrounded by a viral coat, but they lack all the machinery necessary to make proteins and catalyze reactions. This group also includes subviral particles and prions, which are the simplest of life forms, made of naked ribonucleic acid (RNA) or simply protein. The bacteria and archaea are often talked about together under the heading of “prokaryotes” because they lack a nucleus. They do share a few characteristics and aren’t easily distinguished from one another at first, but they are distinct groups.